I hadn’t eaten at KFC in about a decade. Several weeks ago, I went there with my eyes open and had a Grilled Double Down. I asked for it with no sauce (have you read what’s in that sauce?! ); but they unfortunately didn’t honor my request. I didn’t discover this until after I’d left. It was really yummy; but I’m sad about what I put in my body. As I said, eyes open! Check out the Ingredients List! Kudos to them for posting it, at least. If you’re in the mood for KFC, maybe stick to salads. And don’t ever get anything boneless from there! If you are in the mood to try a Double Down, just go ahead and make your own! This post is categorized in food; but i’m not quite sure that it’s accurately labeled. Stephan Guyenet, over at the blog Whole Health Source, linked to an article about how full-fat dairy actually can increase cardiovascular health! Here’s the blogpost. Remember to try to find raw, unpasteurized, not homogenized dairy if you’re going to include it in your diet, from A2 dairy cows and not A1 dairy cows. Herbal tea – aka tisane – is a joy to me. Ima coffee-in-the-morning* and tea-in the-evening gal and one of my favourite teas is Good Earth (thanks to Amy Mac for introducing me to it!). But I’ve been troubled by the number of boxes and teabags that I find myself recycling and tossing, respectively. Even though I’m recycling, I’d rather not even do that to the environment. So recently I’ve been dreaming about being able to make my own herbal tea and avoid the use of boxes and teabags. I’ve been dreaming about making my own ginger-mint tea. So on Sunday, I harvested some mint from the urban garden that Brian and I share (I left the mint from my previous post on my patio to continue to grow roots) and cut up the fresh ginger root that I had in my fridge and spread them out on two dehydrator trays and left for the day. When I got back, I had dehydrated mint leaves and ginger! Today I ground up some cloves and chopped up some cinnamon bark to go with them. 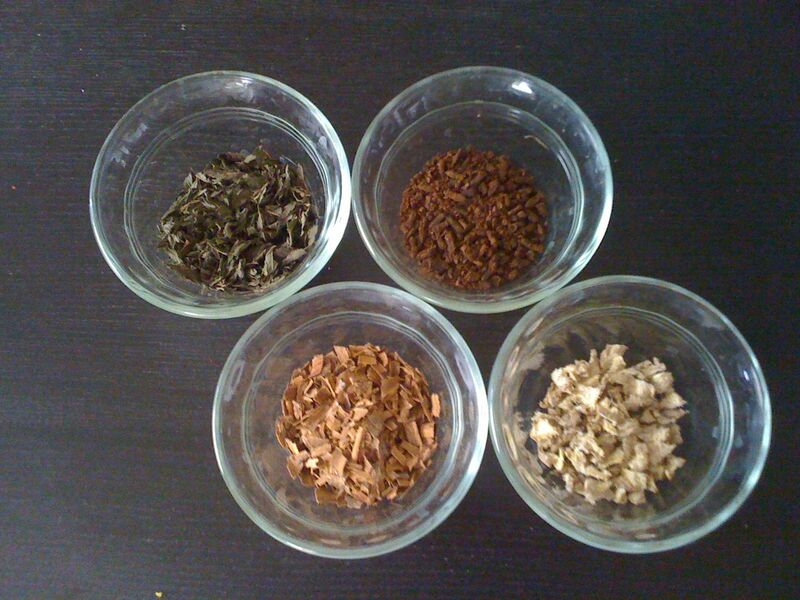 Clockwise starting top left: Mint leaves, coarsely ground cloves, dehydrated ginger root, and chopped cinnamon bark. 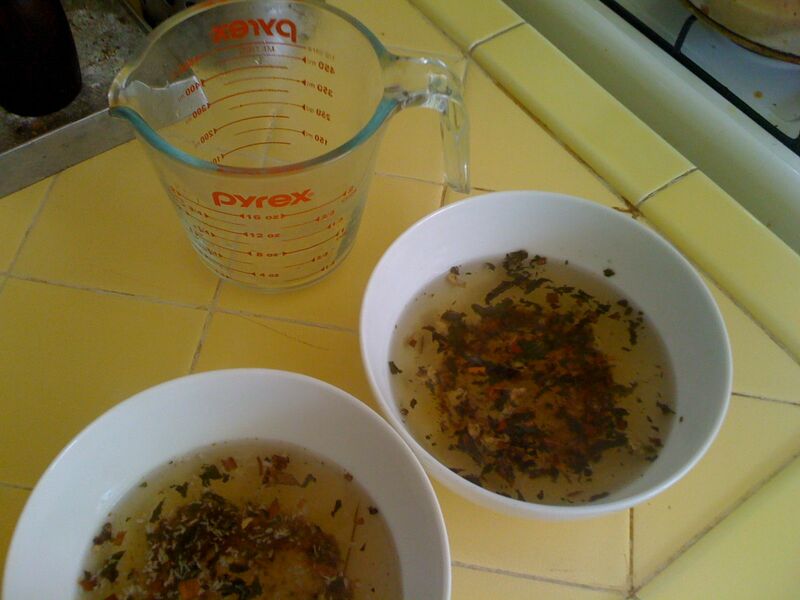 Then I took 1/2 tsp of each and mixed it together in a bowl and added boiling water – one cup. I have two bowls because I tried adding desiccated coconut and pepper to one bowl to see if it added flavour. It did not. 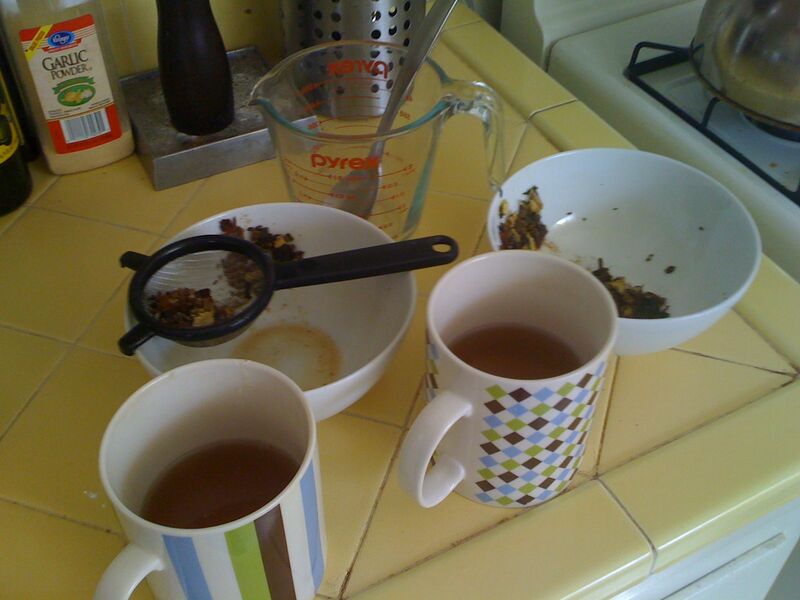 Then, after 5 minutes steeping time, I strained the tea into a mug! It tastes spicy and yummy! I added a small amount of stevia to heighten the flavours. I’ve been sipping this tea as I write this blog post. Next time I think I’ll try adding some loose leaf rooibos or star anise seed. Also, I think I’ll try using less cloves and more ginger. Have you tried making your own tea? * It’s actually a double americano with cream but who’s counting? You are currently browsing the Club Fritch blog archives for May, 2010.